Sub-Studio just featured these incredible Lima 7192 glass jewelry pieces, and the Lush Ring VI-2 is great. Something about the precious glass in such playfully organic shapes ~ so clear it’s practically invisible. 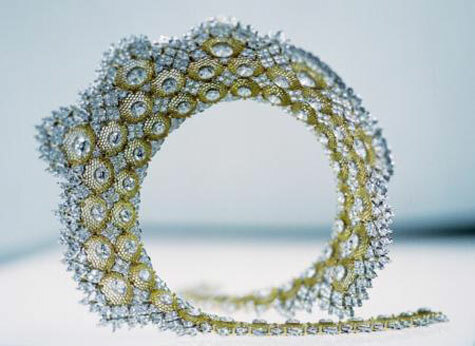 Italian jeweler Buccellati have created this unique masterpiece for the winter season, The Millennium necklace is made of yellow gold honeycomb using a technique used only by Buccellati which is encrusted with 1290 diamonds totaling more than one hundred and four carats of diamonds which are held in white gold settings. The necklace is one of kind and will be available exclusively from Buccellati’s new store in London’s Browns Hotel. The Christie’s set a new record by selling off a gorgeous ring, with a rare red purple diamond, for an astounding 2.6 million dollars. The ring’s stone octagonal has 2.26 carats and stands at being the largest red diamond, ever to have been put up for auction. The proud buyer of the gem is the English jeweler, Laurence Graff. 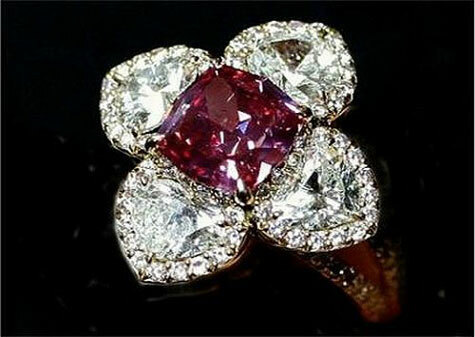 Earlier, a similar colored diamond was 1.92 carats and it went off for more than 1.6 million dollars.